“Korea should adopt plain packaging to lower smoking rate"
Korea’s continuous efforts to discourage smoking by introducing graphic warnings on cigarette packages and levying higher tobacco taxes are laudable but it is time to consider an even stronger measure such as plain packaging, a World Health Organization medical officer said. “Loopholes exist when it comes to measures to effectively control the tobacco industry’s promotion of their products. That’s why a stronger initiative, such as introducing plain packaging should be considered now,” Kerstin Schotte, a medical officer at WHO’s Department of Prevention of Non-communicable Disease told the Korea Herald. 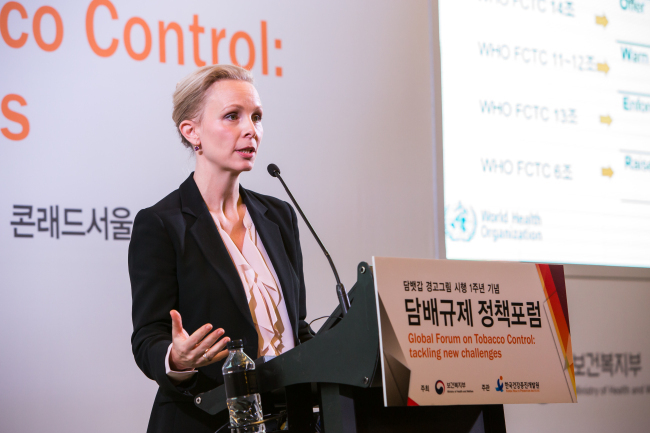 Schotte was in Seoul for a global forum on tobacco control hosted by the Korea Health Promotion Institute and held in Conrad Seoul on Friday. Tobacco has killed half of its consumers. Cigarettes are maybe the only legal product that kills its users, Schotte said. Global data compiled by WHO showed that the tobacco prevalence has decreased over the past seven years in all income levels, but the number of tobacco users has been steadily increasing. “But we are not against smokers. We do not see smokers as bad people. Most smokers want to be able to quit. But nicotine is too addictive. So smokers do not manage to quit,” she said. Adding that WHO’s enemy is the tobacco industry, she stressed that the industry would not make plain packaging on their own unless such a system is mandated by law like in Australia. Plain packaging refers to packaging that requires the removal of all branding, including colors, imagery, corporate logos and trademarks. Companies are only permitted to print only the brand name in a mandated size, font and place on the pack, normally next to the health warnings. The appearance of all tobacco packs is standardized, including the color of the pack. The removal of branding on cigarette packaging aims to deter smoking by the removal of positive associations of brands with the consumption of tobacco. “The tobacco industry has been using packaging as a marketing tool, and with new laws, the industry will find a gap in policies,” she said. In that sense, WHO encourages the Korean parliament to take lead in introducing plain packaging in all tobacco products, health warnings on heat-not-burn products as well as e-cigarettes, popular alternatives for young smokers here. “Measures that the Korean government has been publishing over the past decade are not weak. But it could become stronger, as there is so much that the government can do, such as put stronger health warnings on the cigarette packs, ad regulations, and tax hike measures,” she said. According to the government, the current graphic warnings on the cigarette packs can be changed in December 2018. Schotte also stressed the significance of the government’s role in establishing smoke-free laws in public to prevent exposing people to second-hand smoke. “In Korea, almost 3,700 people died in 2016 due to second-hand smoking, while the majority of them were women. At the moment, no-smoking areas are quickly multiplying in Korea. There are 17,500 public areas where smoking is prohibited, which include some 3,400 areas close to education facilities such as kindergartens and day care centers. However, the city has been slow to introduce “safe” places to smoke. There are only 43 outdoor smoking booths installed in public places across the capital as of now, which reignited smokers’ criticisms. Schotte said WHO’s end goal is to make tobacco less affordable in Korea. “Past experiences showed that a ban does not work. Instead, the government needs to continue to do what it’s doing. A lot of progress has already been made. We encourage the government to go further, and the WHO will support with technical assistance and resources,” she said.